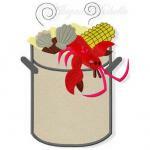 Mark your calendars for this summer's Couple's Home Gourmet - Seafood Boil! We will provide the gourmet meal, and we will ask couples to provide beverages and dessert. We will contact couples individually with specifications. Dinner sign-up is now closed due to space constraints. However, if you are interested in joining us after dinner, please come for drinks.